What does an elephant story has to do with winter?! Exactly, that’s what I was also wondering. In an European country like Romania, where a quarter a year one can anytime expect seeing a scenery like below, one does not really expect bumping into elephants just like that. You won’t find this story you are about to read now under “Medical” or “School stories” section because if you replaced “doctor” and "courses" with “electrician” and “visit”, it would have been the same. 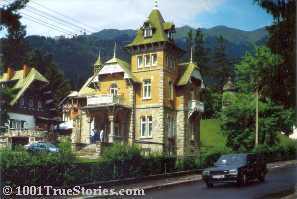 You will find it under True Travel Stories. It happened while Ciprian was returning from the two days course he is holding yearly in a city about 250 km away from his own, for other doctors from cities and towns around. He was driving now his 250 km back home. It was a way he liked to drive on, idyllically winding through plains, then hills and then soft mountains, all full of forests; and through fields with rounded handmade haystacks, bursting with all hues of greens and mowed here and there with real scythes by people who might believe internet is a new kind of newspaper and the cellphone is only meant for calling while away from your home telephone. A quiet world with quiet villages and quiet towns where never happens anything. Towns living a kind of half-life Ciprian thought he would also enjoy, if he could afford to leave his too modern life. Another car with some students from this just finished course of his was driving ahead of him. In one of those so quiet towns giving you the feeling that time stood still in spite of all the modern cars and bright commercial signs, he suddenly received a short message in his cellphone from these (by now) former students of him driving ahead: "Look at the elephants!" ... An elephant-shaped cloud? (No clouds in the sky.) An elephant-shaped weathercock?!? ... Now, this would be something… HERE?!?! No, no way. Nobody would dare to fancy that in this town. REAL elephants?!?!?! Hi-hi-hi. Would YOU expect bumping into penguins after such an SMS on the next street corner? Living with the background feeling of THIS kind of streetscape? 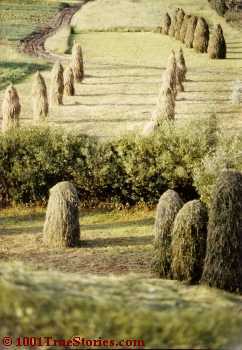 Or in this kind of countryside landscape? ... Which in winter may look as in the first picture above?!? What the heck did they mean?, worth for them to warn him?! They were not his guides in the deepest African savana saying "And now look at the graceful gazelles / antelopes / hippopotamus on the right", or "Mind the rhinoceros just about to impale your sandwich". Romania is a very temperate country with quite common animals no zoo would really vie for. Mere snakes are already almost an event! 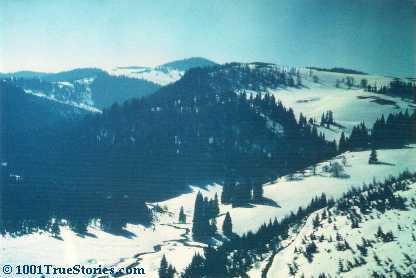 It now occurs me... You might be interested in another story I have just recalled, which happened in (t)his Maramures region. Wow, that one is a top-notch story... I could make a film about it, if I could!! 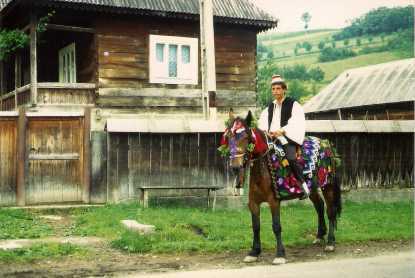 One of my surprises driving through my country was this guy back in ’90 in the northern Maramures region. 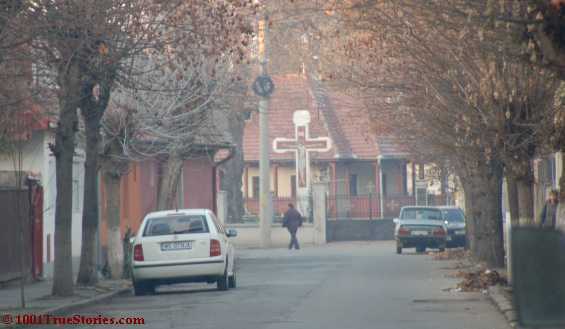 It's one of the very few places in Romania where even now, 2014, some people still do dress traditionally on Sundays. 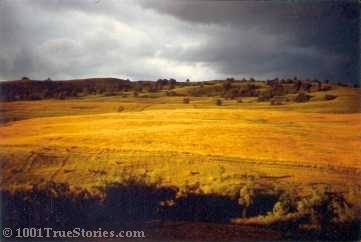 The picture is taken 1990, but don’t let yourself misled by the scenery. The guy might very well have now, the said 2014 - or even then, 1990 - a 1 to 5 years old Mercedes in his wooden barn back home. 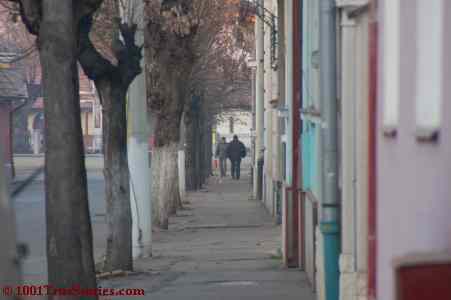 Back to our elephants story, where Ciprian is still driving confused through this small Romanian town. The old barocque houses, legacy from the former Austrian Empire, were fading off and the gaps between them grew larger, when on the field on the right he saw some full size elephants scattered around a small circus just setting up.